No mess, fuss or stress for you to worry about. Alongside your food comes unlimited squash and party hats. Free invites and a months free entry for the party child to return. So included in your party package price is 4 options of food for you to choose, any extra items are priced at 50p per child. Yes of course! We can offer a knife to cut this, help yourselves to our plates and cutlery. Yes of course. We can look after this for you with no awkwardness needed. 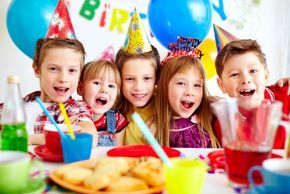 Parents can pay separately on arrival and order food off our menu to arrive at the same time as the party children. Adults remain free of charge. We reserve seating in the main area often near a sofa so adults can relax whilst the kids play. Our kitchen is always available serving homemade food for adults to enjoy when the kids are eating. Free WiFi too. Can you cater for vegetarians/children with allergies? Yes of course. We pride ourselves on being able to cater for all. We have plenty of options to try and keep as similar to the rest of the party food. We do need to know at least one week before. There is plenty of managed parking, especially at weekends where we have a designated overflow carpark. We will prioritise our parties and avoid overbooking. We usually recommend 90 mins for playing, 30 minutes for food and 30 minutes at the end to play. Only private hire (£20), daytime parties you can pay on the day of your party cash or card. Thank you for contacting us. We will get back to you as soon as possible. If you have not had a response within 24 hours please call us 01579 370939.